Osteria Reale - Via Cardamone, 75 - frazione di Gete, Tramonti Amalfi Coast Salerno - Italy. 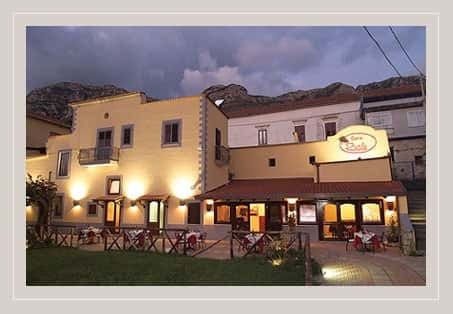 In the fresh village of Gete (Tramonti is composed by several villages), near the rocky church of St. Michele Arcangelo (VIII century), the Osteria Reale allows its guests to enjoy both the authentic typical rurality of these areas of high hill and the pleasure of a refined and good quality kitchen. Immense pergolas of "aglianico tintore", "piedirosso", "biancazita", "biancolella" and "pepella" (autochthonous vines) welcome all those people who want to spend a nice evening, breathing country air without going away to much far from the sea of the Amalfi Coast. The wood of the beams, the stone of the walls, the fragrance of the ripe grape and the suffused and romantic light of the candles and of some well placed lanterns formed a wonderful backdrop to our alfresco dinner, in a quiet evening of July. The "antipasto della casa" (the appetizer of the house) is formed by pork meat and fresh dairy products of Tramonti (those ones of Vicidomini's farm), some puff pastry with vegetables; the cottage cheese with the grated peel of "Sfusato Amalfitano" lemon is simply unforgettable! The other hors d'oeuvre was the "sarchiapone", a typical dish of Atrani, made with long courgette, milled meat, little tomatoes and shards of great Parmigiano Reggiano. Both of them were excellent and well-seasoned! We have chosen two fresh and summer first dishes, "gnocchi con broccoli calabresi e vongole" (gnocchi with broccoli sprouts and clams) and "fusilli di Minori con fiori di zucca, vongole e cozze" (fusilli pasta with courgette flowers, clams and mussels): it could seem a risky binomial, but it is a successful experiment. Our desserts were a portion of chantilly cream with blackberry and a piece of fig and almond pie: they were very delicious! Let's talk about wine. We have followed Giggino's advice (he is the Osteria's manager and he is a good judge of "his" wines) and we have chosen a bottle of "Getis 2006" directly from his wine vault, a young roseate wine with the pleasant aroma of wild fruits, made with "tintore" and "per e' palumm" vines. The Osteria Reale is the ideal place for who appreciate the good wine and an excellent kitchen and wish a calm and fresh atmosphere; an oasis of quiet and taste not too far from the sea of the Amalfi Coast!